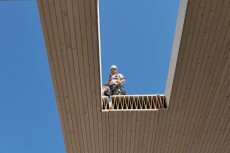 Our Scandinavian partner Control AS has completed a project using Kielsteg for the roof of a CO2-certified supermarket. 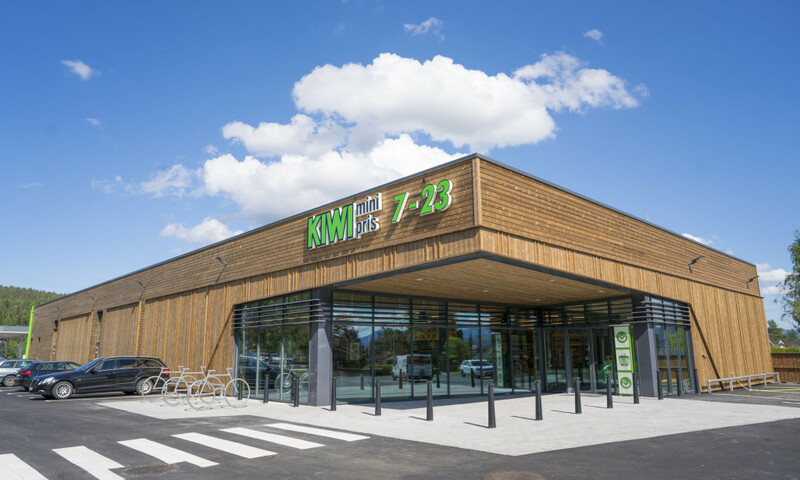 The Kiwi supermarket chain, which has 650 stores in Norway, has opened a new shop in Skollenborg, a town about 90 km south-west of Oslo. The company has set itself the goal of operating as sustainably as possible: for this reason 70% of the products sold are from Norway and the building materials are CO2 certified. The Kiwi store won the architecture prize. The jury commended the clear architecture, the accessibility features for vision-impaired people and the easy-to-navigate organization of the shop, and highlighted the significantly reduced CO2 footprint of the whole project. 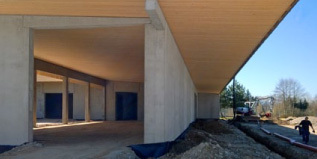 The building is constructed to passive standard. The Kielsteg roof covers an area of 1300 m² and has clear spans of 23 m while remaining strong enough to withstand Scandinavian snow loads. The CO2 reductions were partly achieved by insisting on materials that were produced with lower-than-normal CO2 emissions – including the concrete, insulation material, steel and asphalt. Kiwi’s head of store development, Jan Eilif Johansen, says the prize shows that their design is well accepted by the market. The way this store was built applied new knowledge to achieve even better functional and environmental benefits. 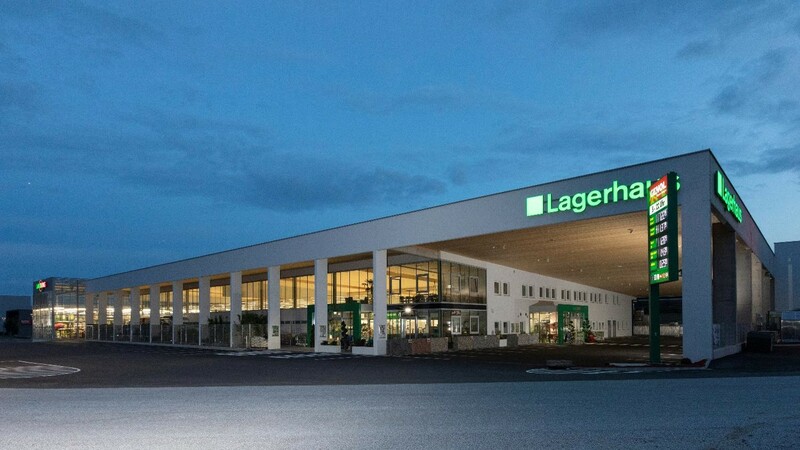 As the chain with the most stores in Norway, the company sees its role as setting an example of how to deal with people and the environment responsibly. In Pirching near Gleisdorf a new complex of a building center in a very modern design is realized for Landring. For the shop building with 3,530 m² of floor area, the company has chosen a wooden roof structure for its sustainability, performance and aesthetics. 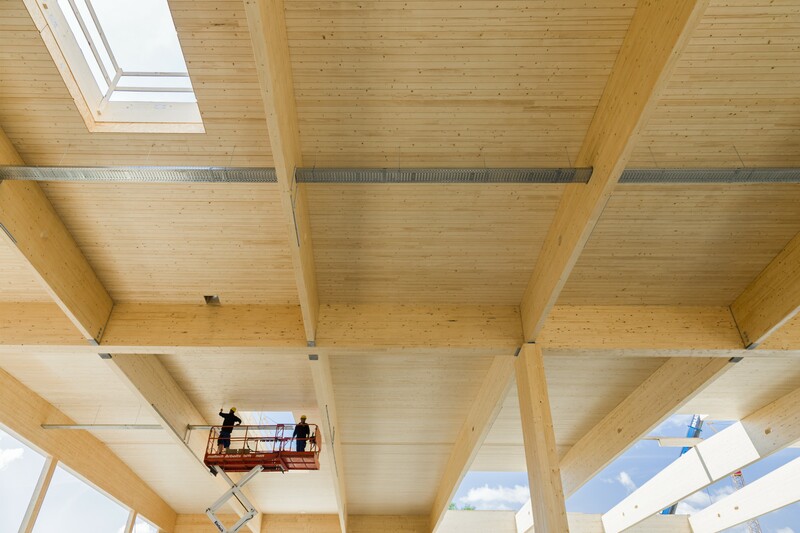 A further important reason for the selection of Kielsteg elements was the flexible use of the building, which results from the outstanding structural performance of the wooden elements. The Kielsteg elements used aware as a visible roof structure which is resting on a classical concrete primary structure. This efficiency pays off handsomely. The Styrian family business Faustmann has been producing furniture and interior fittings to the highest craft standards for 26 years. Their growing production operation in St. Johann near Hartberg, and 11 showrooms with expert customer service in Styria, Carinthia and Burgenland demonstrate the company’s determination to expand. Faustmann decided to build a new factory from scratch to increase capacity and also to improve competitiveness. The new 5,000 m² production space is designed to be as flexible as possible, so that it can be easily adapted to changing market demands. The structure is entirely made of wood and expresses the same clarity of form and material as the company’s furniture. It uses Kielsteg elements as a structural roof and also uses their aesthetic underside as a visible ceiling in the interior of the factory. 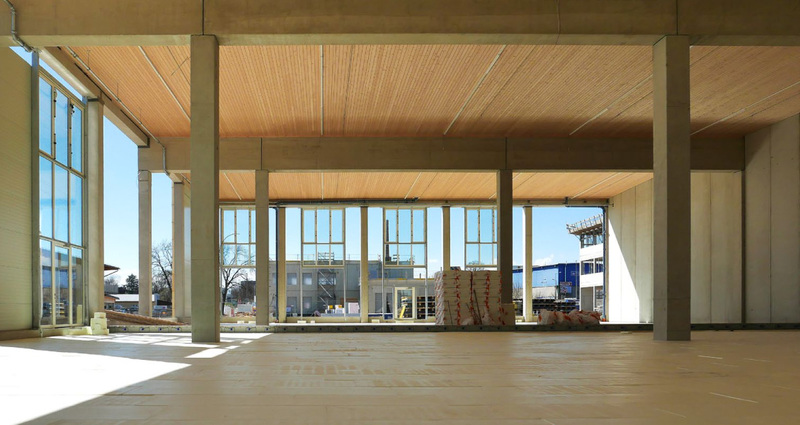 Elements 16 m in length are being used in three spans across a frame of primary and secondary glulam beams and posts, with a span length of 5.25 m. The building uses a total of 3,569 m² of Kielsteg elements in visual surface quality. 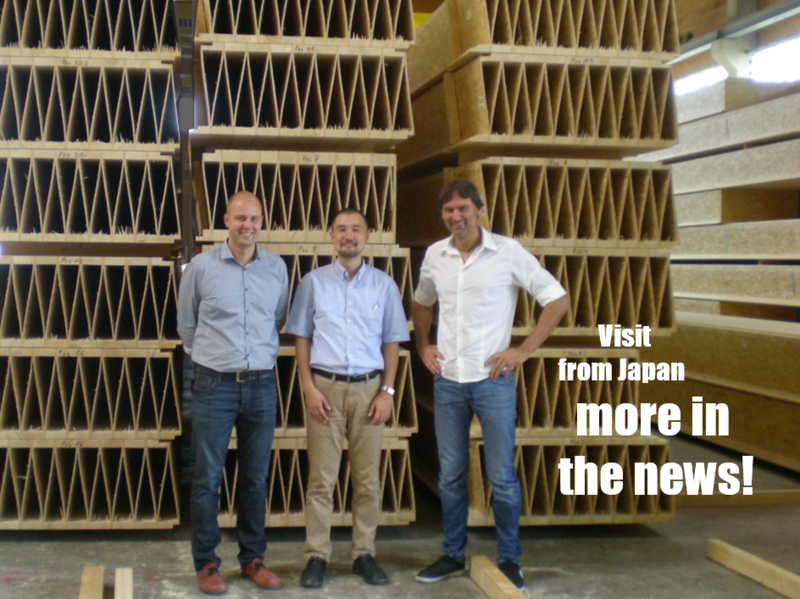 We recently had the great pleasure of welcoming Ryoma Murata from Tokyo for a visit. The purpose of his visit was to explore the feasibility of using Kielsteg elements in a variety of projects. Ryoma Murata is a structural engineer at the internationally famed Shigeru Ban Architects. The main focus of our discussions was on how we could adapt the production of Kielsteg to meet specific needs in terms of structure and geometry. What was most interesting for us was how we were challenged to think far beyond our usual concepts. Now we are busy working out the details of how Kielsteg can be used in a number of specific projects. The constant growth of the successful family business Sigmatek – specialists in automation technology for makers of industrial machines and plant – has resulted in the third expansion phase of their factory location in Lamprechtshausen. This involved adding an extra storey to the office tract and for this project they chose Kielsteg, firstly to minimize the additional load on the foundations. But also, thanks to the wide clear spans of the Kielsteg construction, the new office space has hardly any internal supports. This allows the company to use the space as flexibly as possible, which serves their corporate strategy. 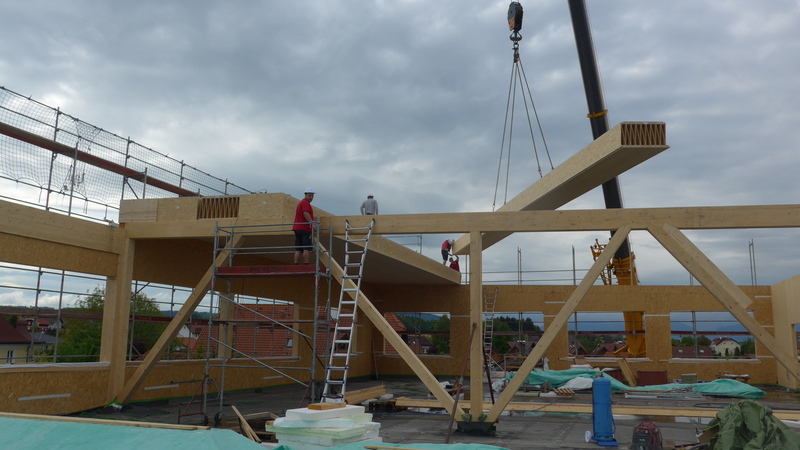 The roof was built from Zenz Timberconstruction from Eggelsberg with high-performance KSE 800 elements, which span the whole width of the building of 25.4 m. The underside of the elements is visible and forms part of the interior design. Merkur goes for maximum sustainability, choosing a wooden roof for the new market in Knittelfeld. A big thank you to everyone at Kulmer Holz-Leimbau! 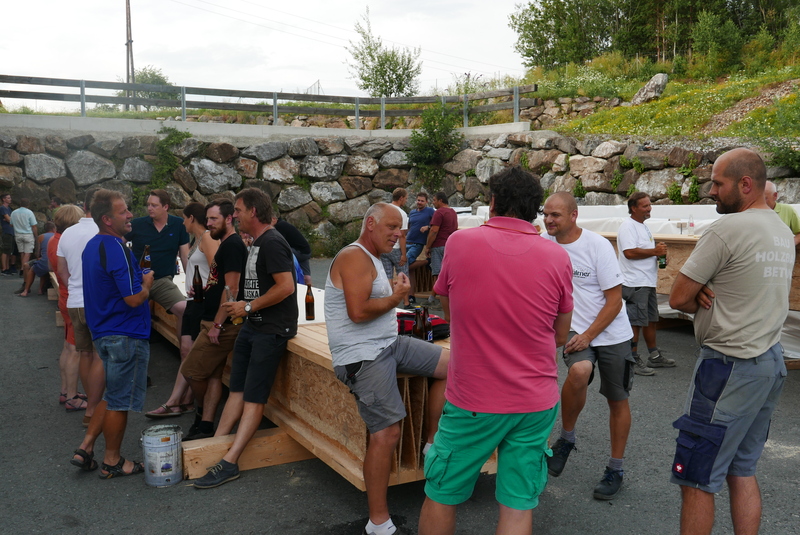 On the afternoon of 20 July, the production team at the wooden building division of Kulmer had a surprise break with snacks and drinks for everyone. The occasion was to recognize the team for the huge work they have done on Kielsteg, and to purposely take a little pause in the middle of a very hectic time to reflect on what we have achieved together. The CEOs of Kulmer, master builders Hannelore Feichtinger and Gernot Kulmer reflected on the current year, which started with the conversion of Kielsteg production to two-shift operation in January, and this will continue into the autumn. With current orders amounting to well over 30,000 m2 of Kielsteg elements, demand and sales have grown enormously. Congratulations to the team that have made this happen! In Graz a new complex of buildings in a very modern design is under construction for APG Allergosan Pharma GmbH. 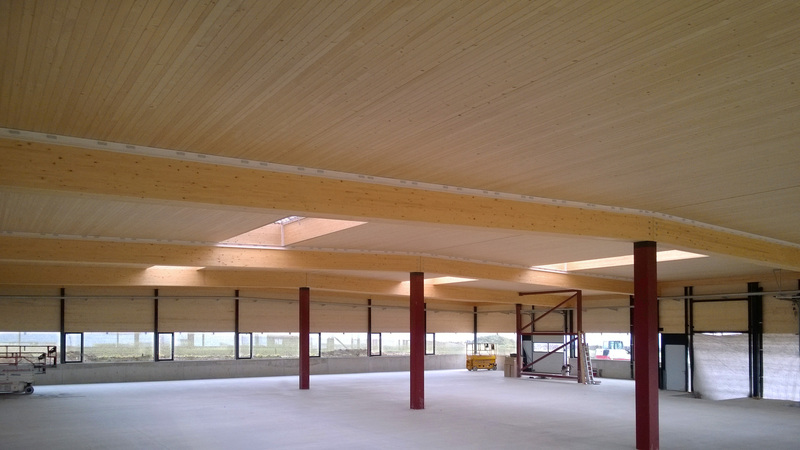 For the warehouse building with 2,185 m² of floor area, the company has chosen a wooden roof structure for its sustainability, performance and aesthetics. The Kielsteg elements used to form the roof are used here purposely as a secondary structure resting on a classical steel-reinforced concrete primary structure. 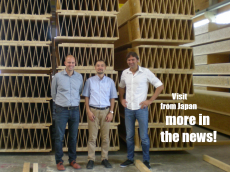 The wooden elements used at Allergosan represent a new structural concept that concentrates material efficiently exactly where it serves the customer’s functional demands. This efficiency pays off handsomely. Since the elements are able to span 13,3 metres, the warehouse structure only needs two truss axes and four posts. A new building has been built near the Austrian town of Wartberg an der Krems for the plastics company PRECIPLAST Kunststofftechnik GmbH. The factory and warehouse with its integrated office complex were built using Kielsteg elements with a span of 10 m. The project used 1,366 m² of Kielsteg Type KSE 280 and KSE 310, which were supplied by the Austrian distribution partner ZMP. The skylights integrated into the elements provide a natural play of light in the interior of the building. An Austrian roofing contactor has used just short of 1,500 m² of Kielsteg elements in their own building project. Hatzmann GmbH chose KSE 280 with a span of 12.3 m for the roof of their new facility. The elements were also used to create a cantilevered roof that projects 4 m beyond the building. 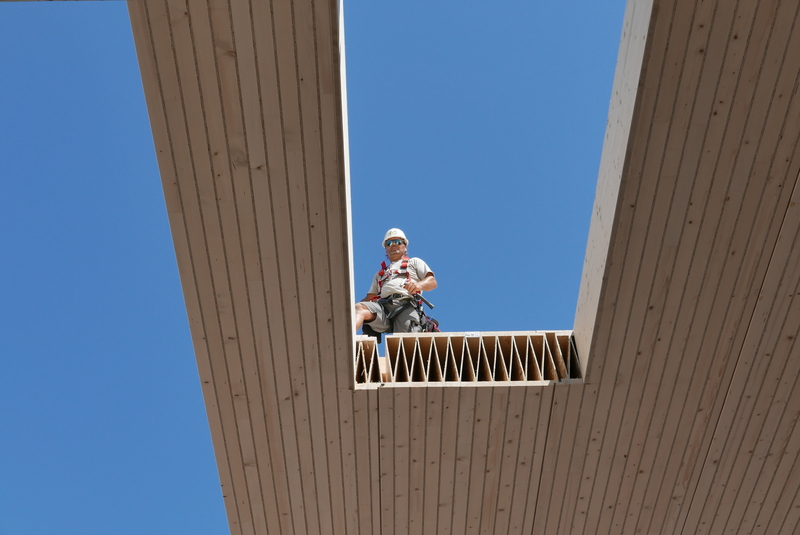 An important reason for the selection of Kielsteg elements was the cost saving compared to other comparable structural solutions, which results from the outstanding structural performance of the wooden elements. The Kielsteg elements were supplied by ZMP GmbH.